Every type of rolled flooring we feature provides the same super-strong vinyl construction, the same exclusive laminating process and the same superior quality of manufacturing. 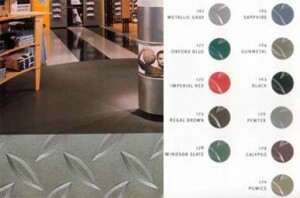 There are over 135 different styles and colors to choose from, for every different kind of interior. Below you will see a small, but diverse, sample of what we offer. This corrugated Switchboard matting conforms to OSHA requirements for electrical protective devices and is tested to ASTM D-178 requirements. Our Switchboard matting also meets the optional requirements cited by ASTM for flame resistance, ozone resistance and oil resistance. The insulating switchboard matting is tested to the requirements of Mil-M-15562F type III. 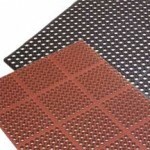 The matting displays an attractive diamond deckplate surface pattern. There are many industrial and commercial applications that take advantage of the characteristics unique to this specification, which include testing requirements for performance following exposure to sulphuric acid, oxygen bomb aging and ultraviolet light exposure. This matting is especially recommended for service where water drainage is a prime concern. The corrugated top does the usual fine job of providing a dirt-removing surface, while the pebbled back allows water and air to circulate under the matting, permitting flooring to dry. This long lasting, all-purpose matting for use in industry, homes and office buildings features an open construction that prevents dirt and mud from caking on or clogging the surface. 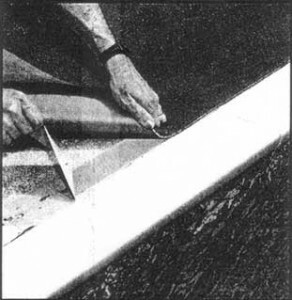 Round rib corrugations run lengthwise and are easily cleaned with soap and water. Also available are heavy duty (doubling the thickness to 1/4″) and spike-resistant ideal for golf courses and/or locker rooms. This matting is specially designed for those applications where slip resistance is an important factor. The top of this matting has been molded with a non-directional pattern consisting of sharply pointed pyramids covering the entire surface, The bottom of the mat has a specially knurled texture to provide for skid resistance and optimal bonding characteristics. The interesting nubby surface pattern on this matting assures safe footing. Ideal for light traffic areas. Easy to clean and long lasting, this mat is a steady performer. This lightweight, corrugated matting on this matting is designed to keep dirt and moisture from selected floor areas. Not designed to relieve heavy wear. Easy to put down and take up. 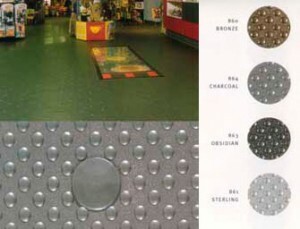 This extra heavy duty 3/16″ ribless matting is for use in ice and skating rink applications. This matting is spike, cleat and skate resistant. 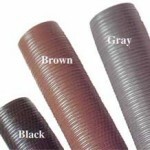 The rubber matting is designed with sharoply pointed corrugations running lengthwise. 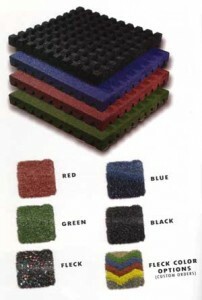 This is also the product for those who must have rubber matting. Also available in heavy duty, with trice the thickness, 3/16″. 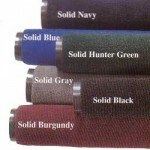 All our mats come in a multitude of colors including: Marina Blue, Brown, White, Terra Cota, Gray, OSHA Orange, Olive Green, Black and Clear. Thickness and roll lengths also vary. Contact us for more information and exact specifications. 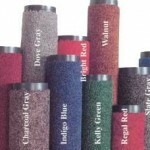 Heat set fibers resist matting down and allow dirt to filter between them hiding it from sight. Each year over 200,000 children are injured on American playgrounds. That’s over 22 children per hour or 548 injuries per day! Of those children’s injuries, the majority were sustained by falls from the equipment to the surface. It has also been found that about 80% of playgrounds have unsuitable playing surfaces. These playground tiles meet the Consumer Product Safety Commission and American Disability Act requirements. 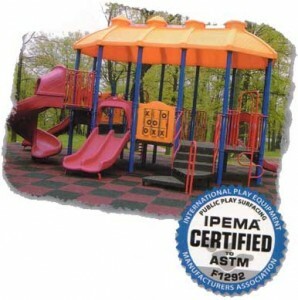 All tiles meet the Head Injury Criterion tests for applicable fall heights and are certified by the international Play Equipment Manufacturers Association. We currently offer three types of specialized aerobic flooring. We have The Aerobic Flooring Machine that provides the precise shock absorption and impact isolation that every athlete requires. Aerobic tile and Cub Tile is another option that provides a cost effective alternative to hard wood floors while providing maximum flexibility – the floor can easily be moved to other areas as needed since it does not require any permanent adhesive. The system is designed in three components. The most visible part the wood surface is designed for precise footing and aerobic exercise. The boards meet and a tongue and groove joint and are held together by a spring steel clip, which allows the floor to flex along this joint and then spring back into place. 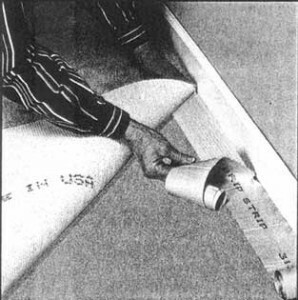 At the point of impact, the continuous 3/4″ foam underlayment beneath the wood and clip assembly absorbs the shock of the impact on the floor and dissipates the resultant energy. 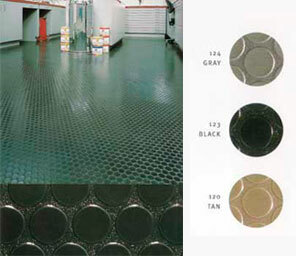 Aerobic tile is a great, cost effective choice for an anti-fatigue resilient floor. Each 12″ X 12″ tile has over 250 raised discs along with 3/4″ thick resilient, cushioning air support. Aerobic tile has similar performance characteristics as a floating hardwood floor with a built in sub-floor. 35 pounds of pressure is all that is needed to activate the sub-floor, making it a very forgiving on ankles, joints and lumbar. Cub Tile has similar characteristics to Aerobic tile, however, it is especially designed for wet environments. It is very comfortable to stand on with bare feet and works great in wet areas or where a little more foot comfort is needed. SporTec® flooring systems are designed to provide the absolute meridian in safety and performance for today’s indoor athletics industry. Its load-carrying capacity is a crucial property in the flexible yet strong inner elastic layers. SporTec flooring systems provide unmatched security creating maximum performance for personal training and competition. Athletes and trainers alike have trusted the SporTec name for many years and with good reason. After all, a floor’s quality is not judged by the people who produce them, but by the people who use them. Our PowerMat™ is strong enough to withstand the wear and punishment of free weights and fitness equipment. That’s why this product is specified in some of the countries largest and busiest fitness centers. These mats are made to last for years under heavy use and traffic. The PowerMat™ is cost effective and offers a great value. Mats are easily shipped from strategically placed warehouses throughout the United States. Provides safe and secure flooring for members and exercise equipment. The Martial Arts Tiles have strong, precisely fitting interlocking tabs on all four sides so you can design and assemble a floor of any shape or size within minutes. The surface pattern provides just the right amount of traction for bare feet and athletic shoes alike. These tiles absorbs the impact of throws and takedowns, as well as being lightweight and portable for demos and tournaments. Individual tiles measure 40″ x 40″ x 7/8″ and weigh less than 7 lbs. each. They are available in blue, red and black. Our interlocking flooring is designed to provide an attractive interlocking mat so precisely cut that it appears seamless, large enough to not require adhesive but still be manageable, allow versatility in installation, and most importantly, look fantastic! We offer two different types of interlocking floors: a solid black or natural black rubber mat available in a variety of interlocking pieces to meet any need. Our state of the art cutting system provides a virtually seamless appearance. 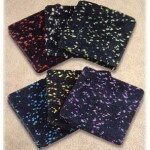 A step above from the standard black mats is a colored fleck mat that adds specs of pearl, green, grey, and blue. Other colors are also available. Super Sized Tabs! We have found that smaller interlock tabs over time, easily pull apart and tear when stressed or pulled. Out interlocking mats feature a super sized tab that is a full 6 3/8″ wide and 4″ deep. It stays where you put it and does not come unlocked under heavy use. All rubber weight plates are the newest addition to fitness centers and weight rooms. The plates reduce noise and damage to floors! Each weight plate comes with a metal bushing. Colored Plates Available, including: Red, White, Yellow, Blue, Green and custom colors! Mat Glo rubber cleaner has been formulated to clean and deodorize rubber flooring while it restores it’s original appearance. Mat Glo can also be used in locker room flooring and areas that need to be kept clean and smelling fresh. Size: 2 1/2 in. X 75 ft.
CX-941 is a one-component polyurethane-based trowel-grade, structural adhesive. Its elastomeric properties enable it to move with wood as it expands and contracts. The patented formula is VOC complaint, and it contains no solvents or water. CX-941 provides excellent initial grab and outstanding bond strength. It is formulated for indoor and outdoor applications.